Mammoth Mountain Bike Park has opened its newest freeride trail, Twilight Zone. The highlight of this newest trail is “The Deep End”, a nine-foot tall, 50-foot wide, elevated, banked wooden bowl structure. The Mammoth website says: "To get there, take a right off Chain Smoke and fly through a series of dirt jumps and turns leading into "The Deep End"... The Mammoth Mountain Bike Park is 100% open with over 100 miles of trails and 3,100 feet of vertical descent." 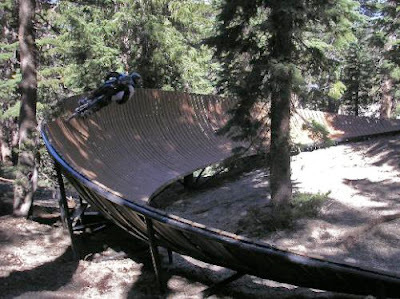 Photo courtesy of Mammoth Mountain Ski AreaCaption: "The Deep End" is an elevated, banked wooden bowl sure to enhance the expansive trail system at Mammoth Mountain Bike Park.